This tool calculates how much interest is added to the initial principal amount, so that, from that moment on, the interest that has been added also earns interest. This addition of interest to the principal is called compounding. John deposit $1000 in a bank account offering 3.5% interest, compounded quarterly. After 2 years how much money will John earn? 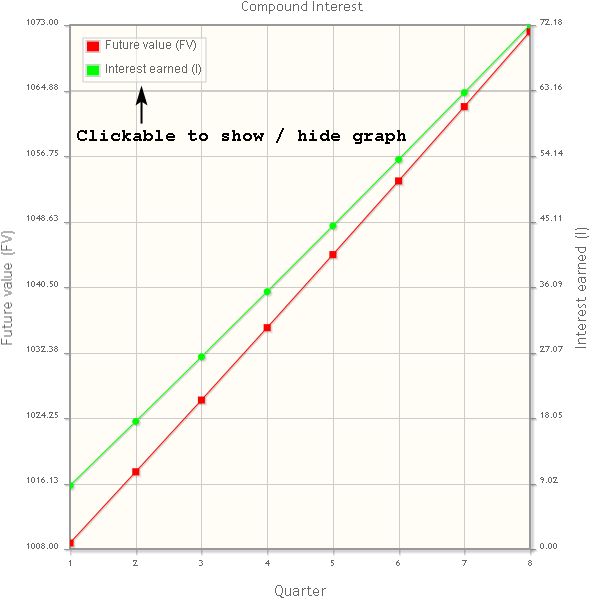 Draw two graphs in a single plot (see image above). To show/hide a graph click on "Future value (FV)" or "Interest earned (I)" in the plot legend.